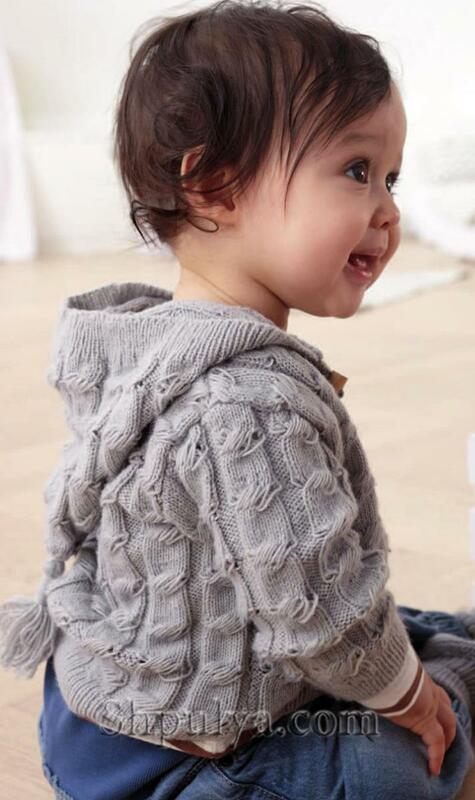 You will need: 2/4 skein of gray (01090) Schachenmayr Baby Smiles Suavel yarn (100% acrylic, 366 m / 50 g), needles No. 2.5, 3/4 buttons. Gum: alternately 1 persons., 1 out. The main pattern: knit pattern. To start with the item before rapport, repeat 12 points of the rapport, finish 2 points after the rapport. Repeat from the 1st to the 12th p.
Back. Dial 105/129 p. And knit 3 cm with an elastic band, starting in the 1st with the inside. R. with chrome., 1 out., ending symmetrically. In the last life. R. uniformly add 7 p. = 112/136 p. Next, knit the main pattern = 9/11 rapports. At a height of 16/29 cm from the typesetting edge for armholes, close on both sides 4 p., Then in each 2nd p. 2 x 3 p., 1 x 2 p. And 2 X 1 P. = 84/108 p.
At a height of 28/35 cm from the typesetting edge for the bevels of the shoulders, close on both sides 1 x 7/10 p., Then in every 2 m p.: 2 x 7 p. / 1 ​​x 10 p. And 1 x 9 p. At the same time, to cut the neckline, close the middle 16/24 points and knit further separately, closing along the edges of the cutout in each 2nd p. 1 x 7 p. And 1 x 6 p.
Left shelf. Dial 49/61 p., Knit 3 cm with a rubber band, starting in the 1st with izn. R. with chrome., 1 out., 1 person., finishing symmetrically. In the last r. uniformly add 3 p. = 52/64 p. Next, knit the main pattern = 4/5 rapports. 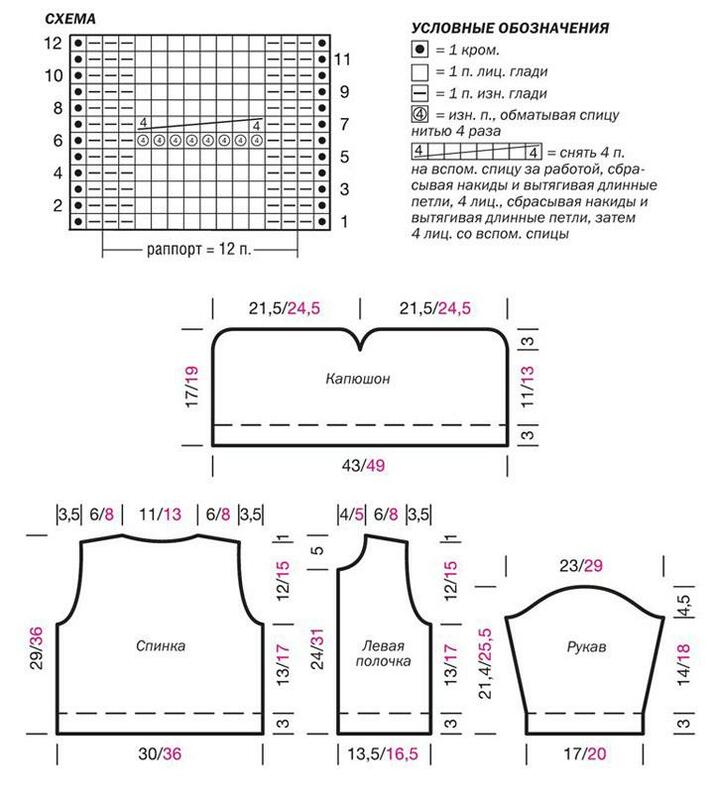 At a height of 16/29 cm from the typesetting edge for the armhole, close the 4 on the right side and in each 2nd p. 2 x 2 p., 1 x 2 p. And 2 x 1 p. = 38/50 p.
At a height of 24/31 cm from the dial edge for the neckline close on the left side 4/5 p., Then: in each 2nd p. 1 x 4 p., 2 x 3 p., 1 x 2 p. And 2 x 1 p., In each 4th p. 2 x 1 p./in each 2nd p. 1 x 4 p., 2 x 3 p., 1 x 2 p. And 3 x 1 p., In each 4th p. 2 x 1 p. = 21/29 p. At a height of 28/35 cm from the typesetting edge for a bevel of the shoulder, close on the right side of 7/10 p., Then in every 2nd river: 2x 7 p. / 1 ​​x Ju. and 1x9p. Sleeves. Dial 64/76 p., Tie 3 cm with an elastic band and knit with the main pattern = 5/6 rapports. For bevel sleeves 7th / 5th p. From the gum add 1 x 1 p. on both sides, then: in the 6th p. 1 x 1 p. And in every 4th p. 10 x 1 p. / In each 4th p. 16 x 1 p. = 88/110 p., Including the added p. In the pattern. After 17/21 cm from the typesetting edge for the neck, close the sleeves on both sides with 1 x 5/6 paragraph and in each 2nd river: 3x4 paragraph, 2x3 paragraph, 2x 4p., 1x5p. / 3x5 p. , 2 x 4 p., 2 x 5 p., 1 x 6 p. = 16/20 p. At a height of 21.5 / 25.5 cm, close the remaining 16/20 p.
Hood. Dial 160/184 p., Tie 3 cm with an elastic band and knit the main pattern = 13/15 rapports. After 14/16 cm from the typesetting edge, divide the work in half and further knit separately = 80/92 p., Closing on both sides of each part 1 x 1 p. And in each 2nd p. 5 x 2 p. Through the 17/19 cm from the dial edge close the remaining 58/70 p.
Slats shelves (2 pieces). Dial 83/107 p. And knit 3 cm with a rubber band, starting in the 1st with int. R. with chrome., 1 out., 1 person., finishing symmetrically. Link 1 persons. R. individuals. p., then knit a contrast thread 3 p. individuals. satin stitch. Turn the edge connected with a contrast thread, and steam. When the plank is sewn to the shelf, the extra rows will be dissolved. Assembly. Run shoulder and side seams, sew the sleeves. Sew on the sleeves. Sew the slats to the shelves, removing the contrast thread. Sew a hood, sew it to the neckline. Run a brush 8 cm long, sew it to the hood. Sew buttons. Run and sew buttonholes. You will need: 1/2 of a skein of gray (01090) Schachenmayr Baby Smiles Suavel yarn (100% acrylic, 366 m / 50 g), needles No. 2.5, elastic thread. P. rapport, finish 2 p. after rapport. Repeat from the 1st to the 12th p.
Back. For the left leg, dial 40/52 p., Tie 3 cm with an elastic band and knit with the main pattern = 3/4 rapport. At a height of 13/19 cm from the typesetting edge, add 2 liters from the left side, then in each 2nd p. 1 x 2 p. And 2 x 3 p. = 50/62 p. After 15/21 cm from the typesetting edge put all p. Off. The right leg is knit symmetrically. Connect the loops of the two legs on one spoke and knit on all the loops with the main pattern = 8/10 rapports = 100/124 n. After 15/18 cm from the junction, close on both sides 1 x 1 n and in each 16 m / 20- m p. 2 x 1 p. = 94/118 p.
Through 33/42 cm from the typesetting edge, knit with shortened rows [not making up 5 points less on both sides in each 2nd p. and turning the work with the crochet) x 4, in the 6th and 7th p. crossings do not perform. Tie on all loops 1 p. individuals. stitch (knit nakida with the next loop together so that there are no holes) and 3 cm rubber band. At a height of 39/48 cm from the edge of the dial free to close all the loops. Before. Knit like a back, but at a height of 33/42 cm from the dial edge, tie 3 cm with an elastic band and close all items. Assembly. Run side and internal seams. Knit 2 pieces of elastic thread on the belt line. You will need: 1 skein of gray (01090) Schachenmayr Baby Smiles Suavel yarn (100% acrylic, 366 m / 50 g), a set of stocking needles No. 2.5. Gum: alternately 1 persons., 1 out. Shawl: persons. and izn. R. - persons. P.; in circular rows knit alternately no 1 circle. R. individuals. and izn. The main pattern: knit pattern. For bootleg dial 52/58 n. And knit a circle. R. rubber band. After 8/9 cm from the selection edge, lay on both sides 19/22 p. And knit 14 p. For the upper part between the chrome. The main pattern of direct and reverse r. Run 1st and 2nd p. 4/5 times, then 5th - 12th p. 1 time, the 11th and 12th p. 2/3 times. After 4.5 / 5.5 cm to postpone these 14 p. Next, knit garter viscous trace. way: deferred 19/22 p., dial 13/16 p. on the edge of the upper part, middle 14 p., dial 13/16 p. on the second edge of the upper part, delayed 19/22 p. = 78/90 p.
After 2 cm of garter stitch for the sole put 32/38 p. Of the outermost on both sides, knit garter stitch on the middle 14 p., In each river. tying together the last n. from the 1st n. from the side spokes until there are loops on them. Close 14 p. Run the seam. 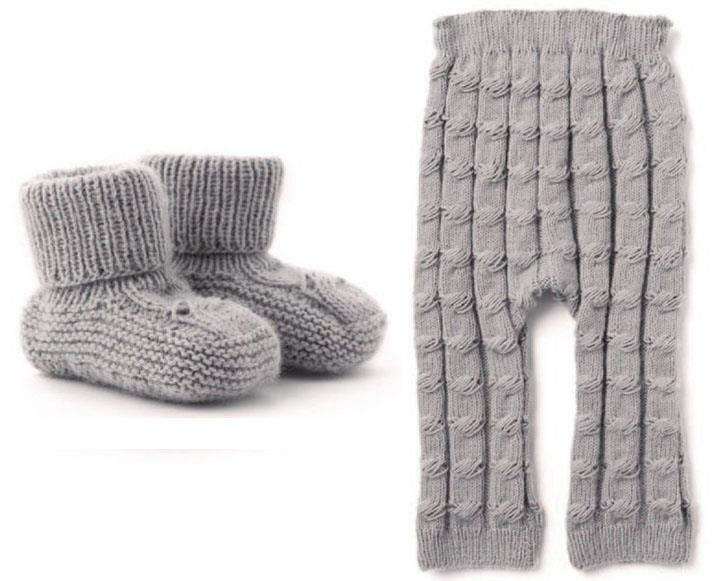 The second bootie knit the same.